What's the secret to creating a successful conference? Providing people with the information that they really want. 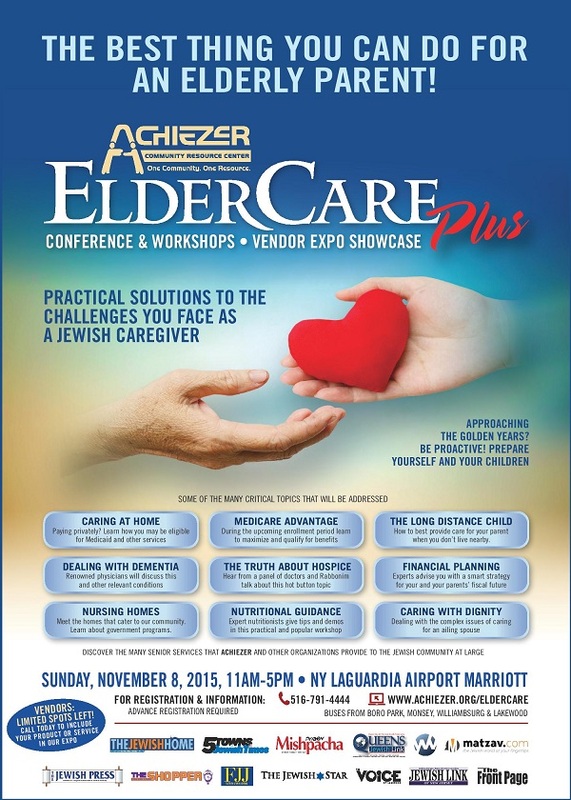 The Achiezer Community Resource Center's highly acclaimed Eldercare Conference is slated to take place on Sunday, November 8, at the New York LaGuardia Airport Marriot. Newly-titled ElderCare Plus, this conference serves as a direct response to the questions that Achiezer fields from hundreds of individuals, all concerned about the many facets of eldercare. I'm a vibrant grandfather in my late fifties, busy with my job, my Shiur, my children, and, thank G-d, growing numbers of grandchildren. I've always believed that a responsible parent plans for the future; and now that I've married off most of my kids, I'm starting to think about securing my assets for a comfortable retirement. If this sounds familiar, you need to be at ElderCare Plus. I live in Brooklyn, my mother lives in Detroit. She's managed just fine all of these years; but recently, things are starting to come up. She's having a hard time staying on top of her medical records and bills, she can't drive anymore, her hearing is starting to go...How can I help her from afar? If this sounds familiar, you need to be at ElderCare Plus. Medicare Advantage has open enrollment, and I know I need to decide on a plan. But I have no idea what to choose! The whole Medicaid/Medicare thing is so confusing and overwhelming, I feel like I'll be making a bad decision no matter what I do. If this sounds familiar, you need to be at ElderCare Plus. My father has been forgetting things. He's missing appointments, losing papers, even wandered out of the house one night and couldn't find his way home; but he adamantly refuses to let us children intervene. If this sounds familiar, you need to be at ElderCare Plus. I'm a fairly knowledgeable 'healthy eater', but everything I've ever learned about nutrition has flown out the window ever since I've become a caregiver. Forget healthy salads; I'm lucky if I have time to grab a danish on my way to yet another appointment. If this sounds familiar, you need to be at ElderCare Plus. My wife has unfortunately battling Stage 4 cancer, and the professionals are telling me to put her in hospice. I know that I can't care for her anymore; but hospice scares me. What should my next step be? If this sounds familiar, you need to be at ElderCare Plus. Featuring a top-notch lineup of professionals skilled in every aspect of eldercare, as well as an expansive array of products and services, ElderCare Plus is the place to get answers to all of your questions - even before you've asked them. Join us on November 8th, as we work together to support our senior population, as well as the dedicated caregivers who devote their lives to taking care of them. Visit the Eldercare webpage, found on the homepage of our website.